* One ton of manufactured cement (1400–1450 °C) releases 850kg of carbon dioxide into the atmosphere ! This is a consequence of the chemical reaction and cannot be reduced by energy saving. * The use of lime instead of cement will save approximately 80% of the CO2 release compared to ordinary cement. One single residence will save between 5,000 and 10,000 lbs of CO2 emissions. Each year in the US alone, environmentally conscientious builders are saving several millions of pounds of CO2 release by simply avoiding the use of cement-based products, and choosing Natural Hydraulic Lime instead. 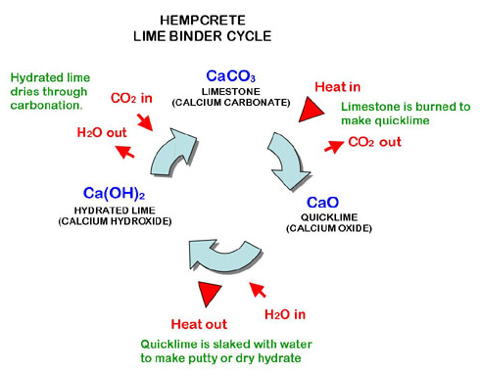 Note: CaCo3 (limestone) goes the full circle from being broken down to carbonation when Hempcrete is formed. As the Hempcrete hardens from carbonation, it will eventually petrify the hemp and form limestone. Lime plaster is a mixture of calcium hydroxide and sand (or other inert filler materials). Carbon dioxide in the atmosphere causes the plaster to set by transforming the calcium hydroxide into calcium carbonate (limestone). Whitewash is based on the same chemistry. To make lime plaster, Limestone (calcium carbonate) is heated to produce quicklime (calcium oxide). Water is then added to produce slaked lime (calcium hydroxide), which is sold as a white powder. Additional water is added to form a paste prior to use. The paste may be stored in air-tight containers. Once exposed to the atmosphere, the calcium hydroxide turns back into Limestone, causing the plaster to set. Lime plasters are used for true frescoes. Pigments, diluted in water, are applied to the still wet plaster. Modern stucco, which incorporates Portland cement, is also referred to as Lime Plaster, but this is incorrect. Lime-and-sand-only mortars are more plastic and better accommodate any settling or movement in the wall than cements, which do not adjust to changes around them once they set. Although lime stuccoes and lime washes are more breathable, they also have better water shedding characteristics. Cement stucco is likely to crack under stress or movement, allowing a route for water infiltration into the interior where it will be trapped. In contrast, lime stucco can better adjust to early movements in the building because it does not set fully all the way through immediately, but only as the interior more slowly carbonates. Any tiny cracks that open can be resealed as acidic rainwater entering those cracks either draws some of the remaining calcium hydroxide into the crack, or, as the slightly acidic rainwater partially dissolves calcium carbonate along the edge of the crack, temporarily creating calcium bicarbonate, re-deposits it toward the front of the crack as calcium carbonates again. This self-healing characteristic of lime is well described in the literature as “autogenous healing”. Hydrated lime can ONLY set through carbonation (re-absorption of CO2). It is often sold in builder's merchants as 'bagged' or hydrated “S” or “N” lime or is available as lime putty (or as quicklime to be made into lime putty), lime putty generally being considered more suitable for pure lime application. Hydrated lime is the most commonly used and known lime, also called (high) calcium lime or air lime, as it sets only by reaction with CO2 in the air and will not set until dry. This causes limitations in construction use as the lime can remain soft for months or years. 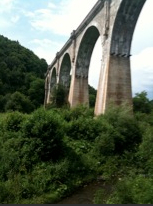 Hydraulic Lime refers to a characteristic of the lime. Lime is an extremely caustic material when wet, with a pH of 12. (Lime becomes pH neutral when carbonated). Protective goggles and gloves should be worn at all times. Additionally, protective clothing should be worn where risk of splatter on to bare skin is present. Clean water should always be at arms length in case lime gets in someone’s eyes or on their skin. Skin can be neutralized with a very mild acid such as vinegar or lemon juice. Repeatedly flush eyes with fresh water for several minutes and consult medical advice. Unlike modern paints, which lay on the surface of the substrate, lime wash instead acts like a stain by penetrating deep into the pores of the underlying material. This process creates a peel-free, breathable surface, and the lime wash remains vapor permeable after it cures. It is a beautiful, traditional material that mellows while it gradually wears away, and over time it develops the weathered patina that characterizes the Old-World charm of Europe. Some of the earliest known examples of lime use for building purposes are in early Egyptian buildings (primarily monuments). Some of these examples in the chambers of the pyramids, which date back to around 2000 B.C., are still hard and intact. Archaeological digs carried out on the island of Malta have shown that in places like Tarxien and Hagar, lime stucco was also used as a binder to hold stone together as well as for decoration at sites dating back as far as 3000-2500 B.C. Ancient Chinese used slaked lime in the construction of The Great Wall of China. Plasters have been in use as "passive" fireproofing products, for many decades: The finished plaster releases water vapor when exposed to flame, acting to slow the spread of the fire, for as much as an hour or two depending on thickness. It also provides some insulation to retard heat flow into structural steel elements, that would otherwise lose their strength and collapse in a fire.